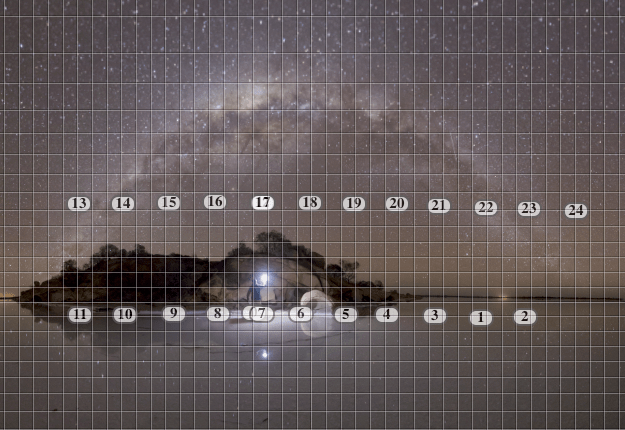 Astrophotography – what’s my shape. 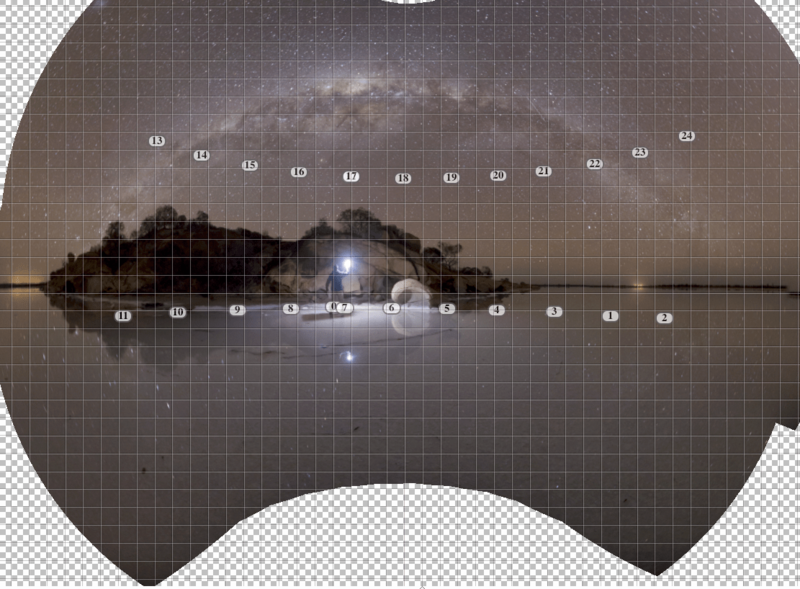 One of the challenges that I have shooting with ultra wide angle lenses for the milky way panoramas. If you take a single frame, you know that panoramas can look a little stretched at times as the stitch can warp the image in order to make it match. I like trying to get a natural looking milky way core where possible and also like a nice rounded arch – but sometimes it’s a little bit of a trade off between the two. There is also the other form of milky way – that I “straighten” out the milky way panorama at the expense of a very substantial distortion to the sides of the panorama as it warps it in. 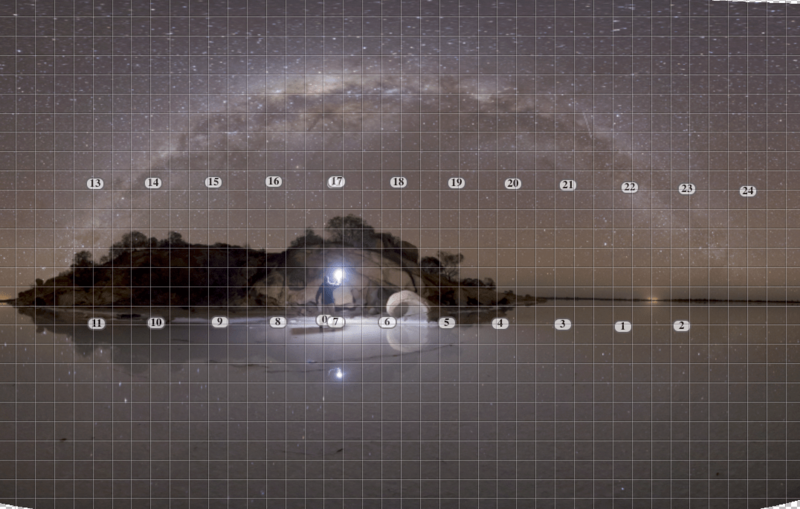 Simply put – if you’re doing a milky way panorama, expect some form of distortion or warping in the process. All these images look a bit over exposed since I shoot at 25-30s ISO 6400 F2.8 for these ones. I expose them more than what is required as part of my image quality to reduce noise. I didn’t really like this one – although the arch is a has a nice rounded feel, the core stretches out a bit and makes it feel like someones grabbing the sides of my head and pulling – try again :P.
This style is more artistic – certainly not for this particular image though. 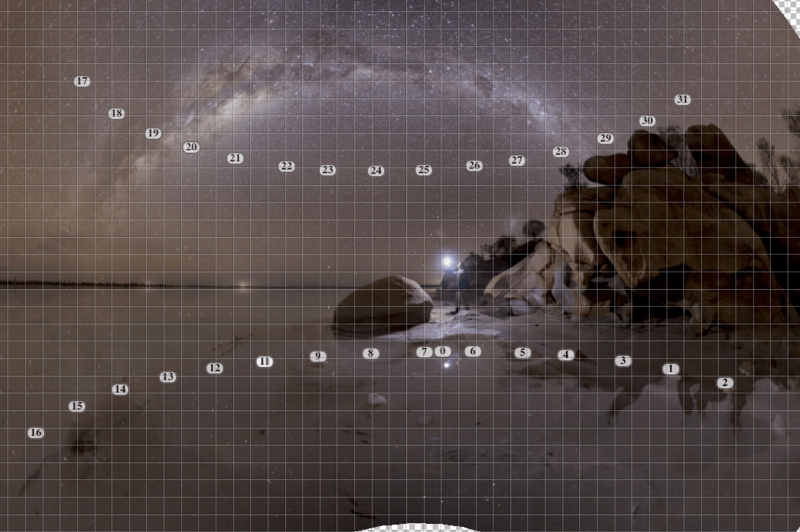 I use this method where the milky way core is higher in the sky. I was a bit tired here – and should have waited a bit longer to do one of these stitches – the rocks look a bit like a mountain. This appears to be a “normal” sort of panorama and you can see the images sequenced in an orderly regular fashion. To be honest, while I used this method for the image, I wasn’t very happy with it since it does make the milky way appear a bit too rectangular. But the core is more natural in this instance and not as stretched as the first one. 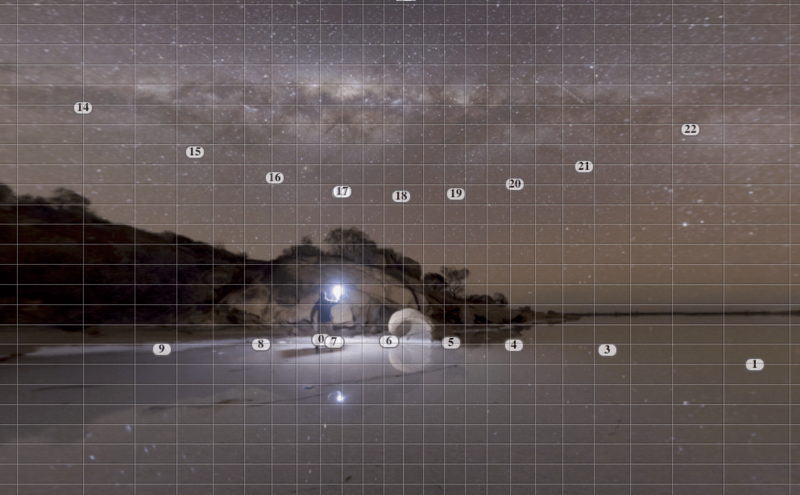 On a setting milky way – this is the regular sort of stitch. I don’t really like how the milky way core here is a bit stretched and making it feel a bit bloated on the left. A bit like when I’ve had too much dairy. Ur – maybe not 😉 Just wondered what it would be like to straighten it out. This particular stitch stretched it vertically – so if the first one was bloated, this one is about to burst. I think I’ve had too much dairy. I preferred this sort in this instance. Didn’t stretch out the milky way as much and felt a bit more natural. I do note however that in each of the above examples, there are ways around shifting a little bit here and there and maintaining the integrity of the image to reduce some of the exaggerations. I just wanted to demonstrate that there are many different looks and I like having a nice arch and minimising the stretching of the milky way core. Thank you very much for sharing your knowledge! It is hard to understand how to create such fantastic nightsky Photography. I’m hoping to see more of your tutorials! One question: I’m living in the northern hemisphere. I never saw the milkyway round like this on the sky. Is this only the stiching process like shown in this tutorial, or is it really visibile like this at your place? Thank you for your fantastic work and ispiration! Hi Chris – for my location here, Antares is on top of the milky way core when it rises, and then as it travel through the night it goes vertical and then flips over so that it is below the core when it sets. If I change to say – Las Vegas, a quick check looks like the MW core generally stays closer to the horizon, but Antares is generally on top of the MW core (except when it’s straight up). The only one that is a result of the stitching process is when it looks like a fish eye which grabs the sides and pulls it in. There are specific sorts of requirements to do that one properly and I’ll probably do a video or post on that at a later date. So in a nutshell – looks like it’s location. Yeah I read that article you posted right after I posted the comment. I’m a photography student in California doing my thesis on astrophotography landscapes. Your tutorials have been a great rescource, thanks so much.